On America Recycles Day November 15, 2010, the White House Administration established a task force to prepare a national strategy for responsible electronic stewardship. 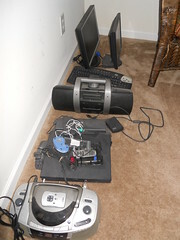 Electronic waste (aka “e-waste”) contributes about 70% of the toxic garbage in our nation’s landfills. This entry was posted in America Recycles Day and tagged 2010 America Recycles Day, America Recycles Day, President's Proclamation. Bookmark the permalink.